I was reluctant but I just had to do it. The hustle to sleep early the previous night apparently didn't pay off. I guess I congratulated myself too early even as I woke up that morning and didn't doze off during my morning prayers. I was glad as I saw empty seats in Church signifying that I arrived quite early. Everything was going smoothly until it was the time for the message. I found myself constantly batting my eyelashes in an attempt to stay awake. I tried shaking my legs continuously to ward off sleep. I even cleaned my fingernails. Even as the first preacher rounded off and it was time to pray, I made sure I held the chair in front of me just in case. I tried every tactic I could. I even contemplated going out to stroll but the idea wasn't quite embracing. With each chant of 'I must not sleep, I must listen attentively', I understood better the "You can't cheat nature" line. While fiddling with the zip of my handbag, I remembered something that made me glow from within. An Eureka moment for me. 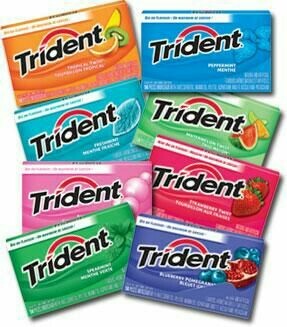 I had Trident in my bag! The chewing gum that left a sweet flavour in my mouth. Now, how do I unwrap it without getting questioning glances from those around me? From the person by my right who seemed to nod at everything the preacher was saying to the person by the left who was looking towards the pulpit with rapt attention? Putting them aside, I successfully cut off a small part of the gum, waited a few minutes before I finally put it my mouth and started chewing it surreptitiously. Just then, my mind went to Him. Would He rather I sleep off or chew gum? Would He rather I take a stroll? Would he rather I stand up and jump? Am I even allowed to feel sleepy? What would he prefer I do? That was my predicament last Sunday guys. Morally, I think it's only right that I chew gum to stay awake but spiritually? What's your take on this? Are you for or against? Have you ever felt sleepy in church? What do you do? Sleep and wait for an usher to come wake you? Chew gum? Take a walk or just keep dozing? If you've never felt sleepy, what's your secret, please? Do you think it's right or wrong? Or just a matter of personal conviction? Let's discuss please. P. S : Chewing the little piece of gum actually helped me stay awake to learn that you shouldn't empty yourself because of someone else's ideas. What did you learn in church? Leave me your thoughts and have a pleasant week. To take meat or not? But one time we were being shown this really basic and sadly, somewhat dull Nigerian Christian movie (which was something different, as we usually see international ones). I'd feel my head start to drop and I'd sit back up straight. To the gum part, I dunno if it's a sin or wrong to chew in church. Personally, I find it helpful. Reason being,I dont talk much in church. And so after the service ends and I need to talk to a friend or something, I always cunningly place my palms over my mouth to inhale my breathe first (I do this everywhere and anytime before talking cos I know how nasty I think bad breathe is). And because my mouth has been closed for a while, I smell the heat. So often times, I like to have gum or a mint sweet in my mouth during the time I'm quiet in church. I has it in my bag. Lool, we gats sit up. I don't think there's anything wrong with chewing gum in church , so far as you are not smacking. True,it can be a distraction but Chewing quietly is cool. I use it sometimes if I feel my breath is stale and keeping sleep at bay. If you're not disturbing with it, why not! Lol. Nice post. I don't see any sin in you chewing gum to stay awake in church. You made an affort. Those around you wouldn't understand and they will end up been judgemental but hey, it's between you and God not you and them. Yes pls, I actually don't see anything wrong with chewing gum to stay awake as long as you are not chewing loudly or smacking. Chewing is way better than allowing ushers to wake you up, it can be really annoying and also a bit embarrassing. Yes, so many times! The weird thing is I try to sleep early so I can be alert during sunday mass but for some reason it's hard for me to sleep early. I usually carry a small note pad and doodle on it or write down blog post ideas! Ahhh, that happened to me on Sunday also. Didn't get much sleep the previous night, and of course I was so sleepy at church. What kept me awake was the fact that I was sitting right in front of the pastor lol. That won't be so encouraging.